In a sauce pan, heat milk, butter, sugar, 2 tspn salt and saffron till sugar dissolves. Do not boil the liquid! Cool until the milk mix is lukewarm. In a large mixing bowl add 2 cups of flour and blend in the milk mixture slowly. Beat at low speed with electronic mixer for 1 minute. Scraping the sides of bowl constantly. Turn out onto a lightly floured surface and knead dough until smooth and elastic (about 8 to 10 minutes). Shape into a ball and place in a greased mixing bowl. Turn the ball in the bowl, so all sides are lightly greased. When the dough has risen, punch the dough down and turn out onto a lightly floured surface. Divide the ball into three equal sizes with a knife. Roll each piece gently into balls. Cover all 3 balls with a clean cloth and let rest. (approx 10 min). 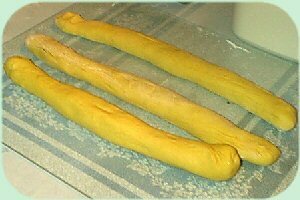 Roll each third into an 18 inch long and 2 inch thick strand of dough. Place on a greased baking sheet, tucked end down. Add about 1 to 2 tblspns of water to egg yolk in a small bowl. 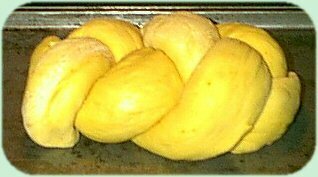 Brush yolk mixture over the top and edges of Challah loaf. * If the dough doesn’t rise after 1 ½ hours, something went wrong and it won’t rise at all. Go ahead and make the loaf, but it will be thick and heavy instead of light and fluffy. Thus is the frustrations of baking with yeast. ** Line up the 3 ropes, 1 inch apart. Begin with the left strand and place it over the middle strand, making it the new middle strand. Take the right strand and place it over the new middle strand, it’s now the middle. Take the right strand and place it over the middle strand. Continue twisting the outside strands into the middle, until the strands are braided. 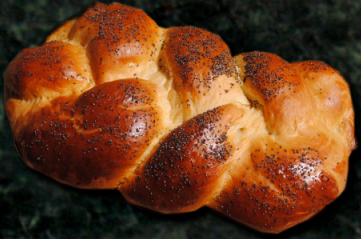 You should have at least 3 braided knots when finished. *** Pinch ends of dough together and tuck under the loaf.